The 2018 Everest Golf Invitational was a success despite increased dampness as the evening wore on. 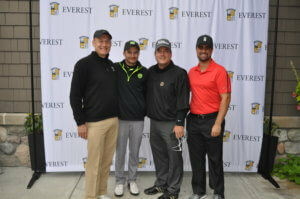 Under the leadership of Everest dads Adam Bowden, Bill Groves, and Thad Schlaud, the Everest Golf Invitational had its largest turnout in five years with 100 golfers. 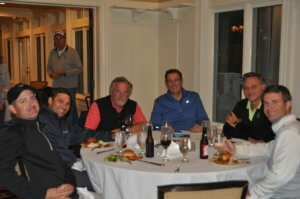 Despite the rain, the participants had a good time at Oakhurst Golf & Country Club. Congratulations to the winning foursome: Everest Academy former student Kyle Mansour, Everest dad and Girls JV Basketball coach Marc Lasceski, EC Alum Class of 2018 Eric Suran, and Everest dad Mike Suran. Our EC alumni also had a strong showing in the contests with Clare Nalepa, Class of 2017, and Adam Legg, Class of 2015, winning the longest drive competitions. Fr. Jason Brooks, LC, won the putting contest. 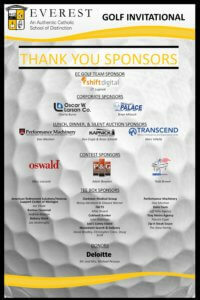 Many thanks to all our sponsors and volunteers who made the day possible!